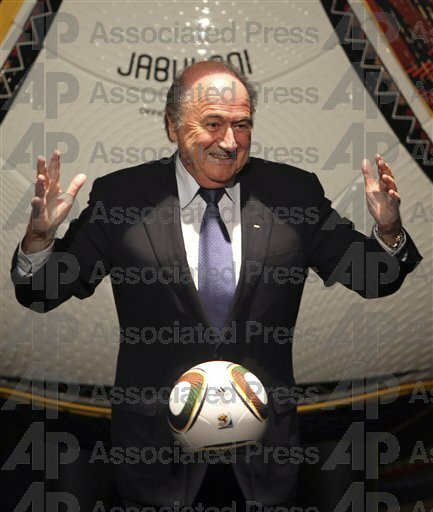 It’s hard to tell if the negative press about the official 2010 WC match ball, the Jabulani, is just posterior-covering by goalkeepers who might get caught out, if it’s documenting legitimate complaints, or if its just a lazy meme for the press to riff off of. One context in which I’ll find absolutely no sympathy is the new wave of English excuse-making, with some Brave English Lions (in particular Emile Heskey, who blew a chop-licking chance to win the England-USA game) blaing the ball for their less than stellar performance. The Germans seemed to have no problem with it! Turns out, like everything else football-related in England, it’s an issue of $$$ & corporate sponsorship! Regardless, England’s toils against the USA contrasted markedly with Germany’s 4-0 dismissal of Australia some 24 hours later. That game was played at sea level in Durban, though England’s players noted the Germans’ success in taming the much criticised Adidas Jabulani ball, with the Bundesliga having adopted the World Cup ball, which had been launched last December, this year. The Premier League has a deal with Nike and could not follow suit, while the Football Association is contracted to Umbro for international fixtures, thereby preventing Capello’s side experimenting with the new ball in the friendly with Egypt in March. England have been using it every day since they gathered in Austria for a pre-tournament training camp, barring the Wembley friendly against Mexico. The Jabulani was, however, used in domestic leagues in Switzerland, Portugal, the United States, South Africa and the Netherlands last season, and in the French Cup and the Africa Cup of Nations. No complaints over its performance were received, with tests in sessions at Chelsea, Real Madrid and Milan also producing positive feedback. There has been an ominous amount of overhit crosses, crap corners, and misplaced passes. Hopefully those who are just now acclimatizing to the Jabulani will start to master it. But I’ve seen a lot of conflicting info…did Iker Casillas, as has been frequently quoted, compare the Jabulani to a beach ball or did he “produce positive feedback” while testing it at Real Madrid? Editor’s Note! : I’m at superintensive archivist’s camp this week, all day every day, so there’ll be no live-blogging for me and I will be watching games mostly on replay. Surely my co-bloggers will have something to say during my radio silence. That said, I’ll try to have some evening ruminations up for you. Particularly in the next two days, with the tournament debuts of favorites Brasil & España! Bear with us, loyal readers!